In September, Google Canada released its 2018 Economic Impact Report, highlighting the successes of Canadian businesses from coast to coast. We also shared their stories through Grow with Google, an initiative that aims to help Canadians access Google’s training and tools to boost their skills and careers. These Canadian businesses run the gamut from a logo maker to a health resource app for new parents to a one-of-a-kind chocolate factory. 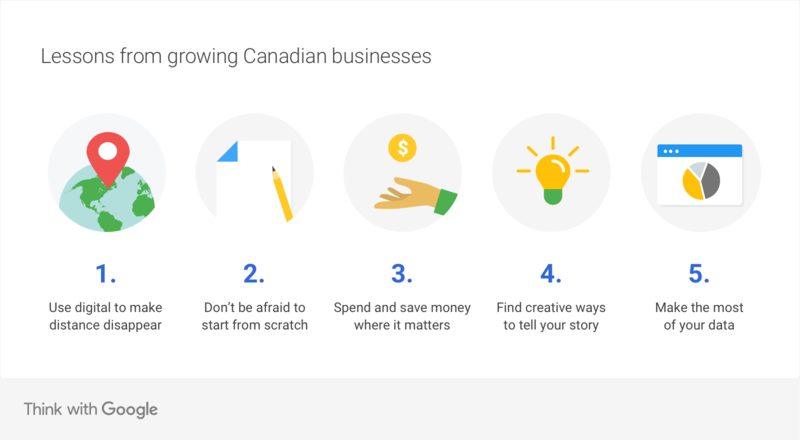 Here are some of the key lessons that marketers can take away from these inspirational, growing Canadian businesses. Some of these businesses got truly creative and resourceful about filling a need, without letting location hold them back. With limited resources and huge distances between communities, Whitehorse physician Chris Naylor struggled to provide sufficient care to expecting mothers in the Yukon. In 2014, he partnered with cancer researcher Wes Wilson to create YukonBaby, an app that hosts helpful information for expectant parents and provides tailored content to their locations. They used Angular, an open-source web application framework developed by Google, to build the first version of the app, which now reaches 40 percent of expecting parents in the Yukon. Tariq Fancy started Rumie in 2013, a nonprofit that uses innovative technology to provide underserved communities with the latest learning content available online, regardless of their internet connectivity. From Liberia to Jordan to Indigenous communities in Canada, Rumie works with on-the-ground partners around the world. Those partners choose from the learning material that Rumie gathers and load it onto a specialized tablet (or any personal Android device using Rumie’s app) for offline use. The Toronto-based company now has 18 employees and has expanded to 23 countries. SkipTheDishes, an international food delivery provider, was not so long ago a prairie tech startup that relied on accessible, no-cost tools to create, maintain and evaluate its digital strategy. The company turned to Google Ads to reach both potential customers and couriers, and help it expand in new markets. The company also uses data and insights from Google Analytics to better optimize its presence on Google Search. Skip, headquartered in Winnipeg, now employs more than 2,000 people and is serving in more than 126 communities across Canada. Logojoy, which produces personalized logos for clients, used Google’s open-source machine learning framework TensorFlow to help classify and create associations between individual features of a logo’s design and its compositional elements. Since its founding in 2016, the logo maker grew from 15 to 33 employees and now has a presence in 188 countries. For Riya Karumanchi, getting no-cost access to a machine learning library through TensorFlow allowed her, at the age of 15, to create SmartCane, a device for the visually impaired. She plans to bring it to market by distributing it through the Canadian National Institute for the Blind. Mabel’s Labels, an ecommerce company based in Hamilton, produces personalized, waterproof name labels and tags for kids’ gear. Co-founded by four friends and working moms, the company started growing by word of mouth, but now uses Google Ads to boost awareness. But Mabel’s Labels has taken it a step further on its blog, “The Mabelhood”. The blog publishes informative, personal posts on subjects like why moms should give up the guilt (“My best mom fails of 2018”), or advice on how to be a happier parent. By creating its very own parenting community online, Mabel’s Labels continues to foster engagement and further its 17% year-over-year sales growth. The Little Potato Company had a challenge out of the gate - to generate awareness about its products and how they should be consumed. Their small Creamer potatoes were difficult to find in Canada when Jacob van der Schaaf first started planting them in a one-acre plot outside Edmonton in the mid-90s. But those little potatoes were a hit, and his family purchased their first production plant to meet demand. Now they’re available in grocery stores across North America. The Little Potato Company has relied heavily on digital marketing to build brand awareness and engagement by publishing consistent, relevant content online like recipes, nutrition information and partnerships with their friends, including celebrity chefs. The company has seen double-digit growth over the last seven years. When Megan Johns started her natural beauty products company, The Green Kiss, in Victoria in 2011, she had a very specific mission - to educate consumers and help them switch from conventional to natural beauty products. Reaching the right people at the right time was crucial, so she used Google Analytics to gain a better sense of where her customers were coming from. “Google Analytics has removed the confusion and guesswork when understanding who our customers are,” said Johns. Her company has seen 60 percent sales growth year over year and she hopes to continue to expand and scale to drive change in the beauty industry. This is by no means an exhaustive list of lessons — there are countless businesses using Google and the power of digital to reach new heights. But if you’re looking for creative ways to grow your business, here’s hoping these stories provide you with a bit of digital marketing inspiration.